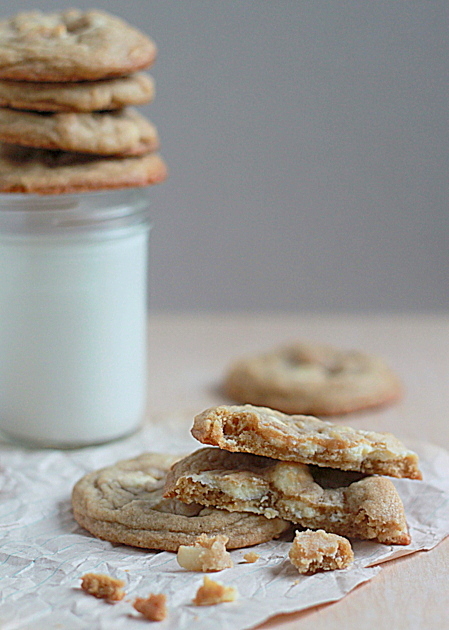 These cookies are thick, soft, and chewy – just what you want a chocolate chunk cookie to be. They’re not too sweet, except when you happen across a nice cool hunk of white chocolate, and when that happens at the same time as when you get a bit of salty macadamia nut, it’s pure cookie nirvana. Pure evil. These cookies are pure evil. I made them, taste-tested them (naturally and thoroughly), photographed them, and packaged them up for my guy to take to work the next morning, lest I shovel them one-by-one into my mouth all day long. But he kept forgetting to take them. And so there they sat, the devils on the kitchen counter, taunting me. “Bite me,” they said. “Eat me!” How rude. But they were so commanding, sometimes I just had to oblige to shut them up. He kindly sat down and ate them all. Granted … there were only a couple left. Yeah, you know you’ve stumbled across an amazing cookie recipe when you have zero self-control around them. Next time I’m putting the container of cookies on the passenger seat of my guy’s car so there’s no way he can forget them. Although … there may be a slight chance I “forget” to include a couple. Yeah, they’re evil, but what can I say? I like that. Cookie Stockholm Syndrome. It’s totally a thing. Here are some notes on shaping, with links to a couple of terrific bloggers who explain it perfectly. I used the Cooks Illustrated shaping method that Michelle of Brown-Eyed Baker explains here (scroll down to right before the recipe). Essentially, you roll the dough for each cookie into a ball, tear that ball in half, and then smoosh it back together so that the torn halves are now at the top of the dough ball. I also shaped the ball so that it was more tall than wide – Sally of Sally’s Baking Addiction talks more about that here. Preheat oven to 350 degrees Fahrenheit. Line cookie sheet with parchment paper or Silpat. In the bowl of a stand mixer affixed with paddle attachment, beat the butter on medium speed until pale and fluffy, about 2 minutes (or use a large bowl and a hand mixer). Add the brown sugar and granulated (white) sugar and continue beating on medium speed for about 2 minutes. Add the eggs one at a time, continuing to beat each time until well-incorporated. Mix in the vanilla. In a medium bowl, sift together the flour, baking soda, salt, and nutmeg. With the mixer on low speed, carefully add the dry ingredients to the wet ingredients and mix just until the ingredients are incorporated. Stir in the white chocolate chunks and the macadamia nuts. Scoop a generous tablespoonful of the dough (I use <a href=”http://www.crateandbarrel.com/cookie-dough-scoop/s252908″ target=”_blank” data-mce-href=”http://www.crateandbarrel.com/cookie-dough-scoop/s252908″>this cookie dough scoop</a>) and roll into a ball. Tear the ball in half, turn each half a quarter turn, and smoosh the dough back together with the torn side now at the top of the cookie. Gently shape so that the dough ball is taller than it is wide and place on cookie sheet about three inches apart. Bake for about 10 minutes, until edges of cookie begin to turn golden brown. Remove from oven and let sit for 5 – 10 minutes on cookie sheet so the cookie can set. Carefully move to wire rack to cool completely. Cookies stay fresh when kept in a sealed container at room temperature for 3 – 4 days, or can be frozen for up to two months. 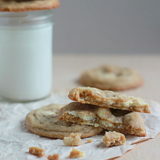 I’m so happy to find this, its my husbands favorite cookie and I’ve NEVER, made them for him. But I just recently have begun my cookie baking journey for serious cookie junkies. Sounds great. I love macadamia nuts! On a Hawaiian cruise last Sept-Oct and in Kauai we got dark chocolate fudge with macadamia nuts. On Hawaii we shopped at Big Island Candies & Cookies and came home with a few goodies. Love that shop and their free samples of everything. Stopped at Mauna Loa Macadamia Nut Factory and bought a few different glazed macadamias. In Maui I got a passion fruit shaved ice with chocolate macadamia nut ice cream. Yummy! And don’t forget all the chocolate chip macadamia nuts at Hilo Hattie! I think you need to go to Hawaii too and experience them all over the place! Gah, all of those macadamia nut treats sound scrumptious – and so does Hawaii right now! We spent 10 days on Oahu a couple of years ago and I am just itching to go back. So amazing. I LOVE white chocolate macadamia nut cookies, but I’ve never made them, probably because I’m terrified (and 100% sure) of eating them all myself. But…I need to make these. They look so good! Pinned and going on my to-bake list for sure! These look like the devil! I would not have been able to have them at my house either. Yum! Evil, horrible, terrible, delicious cookies. 😉 I blame them, not my utter lack of self-control! I make my husband eat all sorts of things I cook and bake too. Luckily he has this insane voodoo metabolism, so he never gains a pound. Honestly, you should be proud of yourself for keeping them around for so long–they look so good, I’d have finished them off after a day! I made these cookies today! We are snowed in and there is nothing like warm oven baked cookies on a snow day…They taste amazing, I was looking for the perfect recipe and this turned out fantastic. My cookies are not as pretty looking as your pictures, I haven’t perfected the ‘tear and smush back together’ method and some of them look like little bums lol! I also used mini white chocolate chips instead of chunks. But the Taste is what matters and they are great. Thanks for the recipe!! Ha! I always think it’s super funny when people have a great cookie recipe and they end the instructions with how long they will last… as if to imply that they will stick around that long. Too funny! And very true. 🙂 I *still* feel guilty about my lack of self-control around this particular batch. Made these this afternoon and they really are something else. The only thing I changed was melting the butter first and I can’t tell how evil they are. We’ve all indulged a bit too much already so I think I’ll be dropping some off in the teachers lounge when I get called in. Hey. I made your recipe and I really like how they turned out! But what do you mean about the “tall trick”, I read it in the instructions and didn’t really understand so I skipped that part. What does the “tall trick” do? Could you explain it to me. Thank you! I make batches and batches of these for my staf…by the end of the shift they are scraping the plate for crumbs and they all think I’m a wizard. AMAZING. 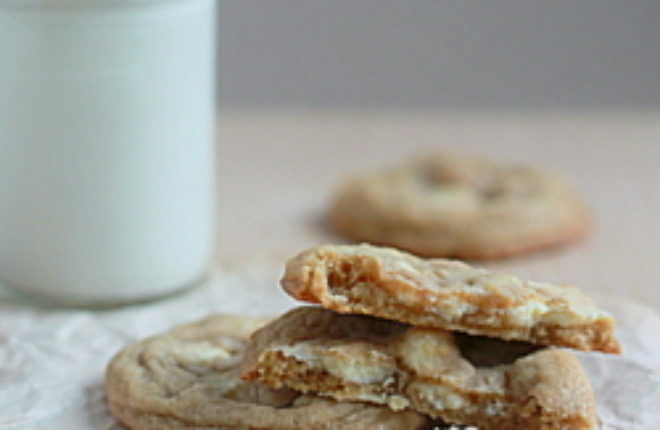 Fantastically delicious cookie recipe! I believe that you roll a ball of that delicious dough and then separate it then you put the two halves, one on top of the other and voila, you have chewy deliciousness. thank you! So glad you like it, Lin! 🙂 Thanks for commenting. The only cookies I bake. Due to dietary changes, I’d forgotten my recipe. This is almost identical to what I remember, so thanks for posting it! In my opinion, nutmeg enhances some recipes… this is not one of them. I’m glad you listed it as optional, because I added it once and it overpowered the subtleness of the butter, brown sugar and mac nuts. Thanks again for refreshing my memory and satisfying my family’s cravings for this beloved treat! Hi Snick! Thanks so much for commenting. It’s my pleasure! The nutmeg is definitely a personal preference thing. 🙂 Happy baking! Good recipe but if you’re looking for that chewy, unctuous, perfect soft richness leave out the nutmeg. For an oatmeal cookie or similar variation, it’s a good note but in the WCMN cookie it’s out of place, and unfortunately saturates the palate to the point that the rich subtleties never make it to the spotlight. Also, an 8 min cook time produced the perfect soft cookie in my oven. On my counter there are two trays, one with 18 or 19 cookies, and tray from the second batch with nary a crumb. How did your cookie turn out so flat? Mine stayed tall even after I let them sat for 10 mins. Not my favorite, only because the nutmeg leaves an aftertaste, will substitute cinnamon the next time. 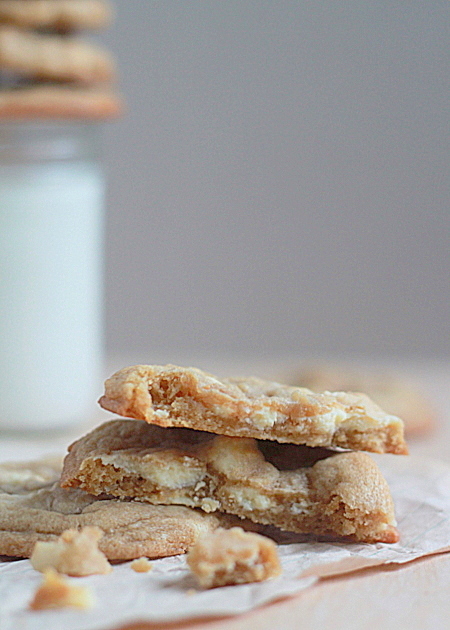 I love soft and chewy white chocolate and macadamia biscuits (our name for cookies!) and these look wonderful. Out of curiosity, why do you add salt when you’re already using salted macadamias? Here, in Australia, we buy butter by weight – 250g and 500 g blocks – how much does a stick of butter weigh? I’m going to make these soon and they won’t last long at all!